Let’s say you just had one of those popular granite counter tops installed in your kitchen. It’s beautiful, stylish, even dramatic. And it makes your cabinets look, what’s the word? Shopworn? Not quite up to the classy look that slab of granite added? On the other hand, new cabinets would be a budget buster in these “interesting” economic times. There is an option. Islander Karen Couser found it. 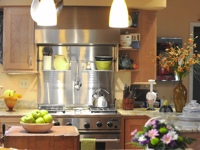 “We are thrilled with our kitchen redo! Bruce and his team did an incredible job of turning our white builder’s grade cabinets into a stunning high-end kitchen. It now looks like it could grace the cover of a magazine,” Couser said. The “redo” Couser referred to was a refacing of her kitchen cabinets by American Wood Reface, a company that serves northeast Ohio, Charlotte, North Carolina, and as of the fall of last year, Hilton Head Island and surrounding communities. The company’s showroom is located in Sheridan Park in Bluffton. “Anything you can think of in custom cabinets, we can do with refacing,” said Bruce Zaidman, one of the company’s principals. “We also make modifications. We can build custom cabinetry, glass doors, shelving. If the customer needs new drawer boxes, we can do custom made, solid wood dove tail jointed boxes with full extension glides,” he added. While refacing cabinets has been an option for homeowners for quite some time, it wasn’t looked upon too favorably. The refacing material was usually a very thin veneer. But the big difference with American Wood Reface, Zaidman said, is the material used combined with the craftsmanship. “It’s the beauty of the whole system. We cover all the end panels, the bottom of the cabinets, the frames with quarter-inch furniture grade plywood. That’s exclusive to us. Doors are attached with a full European hidden adjustable hinge. Every door gets a soft close feature. We replace shoe molding, add light railing under the cabinets” he said. The customer selects the type of wood, the finish, and new handles and pulls to be used. At that time, the customer can also select upgrades, like adding a Lazy Susan, trash bin, wine rack, trim moldings, valances and decorative shelves. Even the height of the counter top can be adjusted if new flooring was put in. Once the project is decided upon, it takes about 30 days to fashion the materials in the company’s facility. 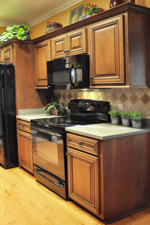 The reasons people choose refacing are not only the age of the original cabinets. Zaidman said he had worked with a developer who was trying to sell a very expensive new home and had a couple ready to buy. The one problem holding them back was the kitchen cabinets. “They hated them. (The developer) wasn’t going to rip out 30- or 40-thousand dollars of brand new cabinetry. He had us reface the kitchen and the house sold,” said Zaidman. American Wood Reface opened its doors in 1979 as a family-owned business just outside of Akron, Ohio. Zaidman became involved in 1988 and opened the Charlotte office in 2000. He then chose the Lowcountry because it seemed like a perfect fit, both because of the age of the homes and the trend to add value to a home through remodeling. “It definitely was the right place,” he said. For more information, visit www.woodreface.com or call (843) 815-6700.